In 1849, responding to public demand for gold, the U.S. Treasury introduced the new $20 "Double Eagle." Minted from 1849-1907 it contains 516 grains of .900 Fine Gold and is the largest Gold coin ever used in U.S. commerce. James B. Longacre redesigned the Eagle reverse, adding a scroll and the motto "E PLURIBUS UNUM" and placing a glory of rays and 13 stars above its head. 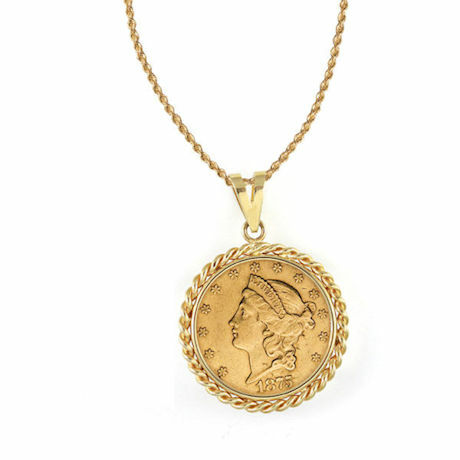 Framed in our beautiful custom crafted 14K rope Gold design bezel, it becomes an exquisite piece of fine jewelry. Comes with a Certificate of Authenticity. Includes an 18" 14k Gold rope chain. Allow 2-3 weeks for delivery. No rush delivery or gift box. Item can only be shipped within the Continental US.